To see the new activity tracker in action, head on over to the reports section of one of your events and open up the By Last Name report. Scroll through the list of registrants and you should notice a new icon in the Tools column for some of the names – give it a click. Note: If a record has not been updated in any way, the icon will not appear. Only registrants with some sort of activity associated with them, (further to the initial registration) will display the activity icon. On the page that opens up, you’ll see a list of instances where this particular registrant was either updated or substituted. There are three possibilities for who modified the record: the registrant themselves, an account user/administrator, or a reports user. Note: If a record is updated by a reports user, the password with which they used to login to your public reports is captured and displayed. In the case of our example, we can see it was updated on two separate occasions by an account holder, (not the registrant herself) who happens to be an administrator for this event. We can also see the date and time at which the update took place, providing a “timeline” of sorts. From here, we can take it one step further by clicking on the descriptions and drilling down to view all the details. The final two columns will display the old value/selection of the field field, along with the new one that was provided during the update process. 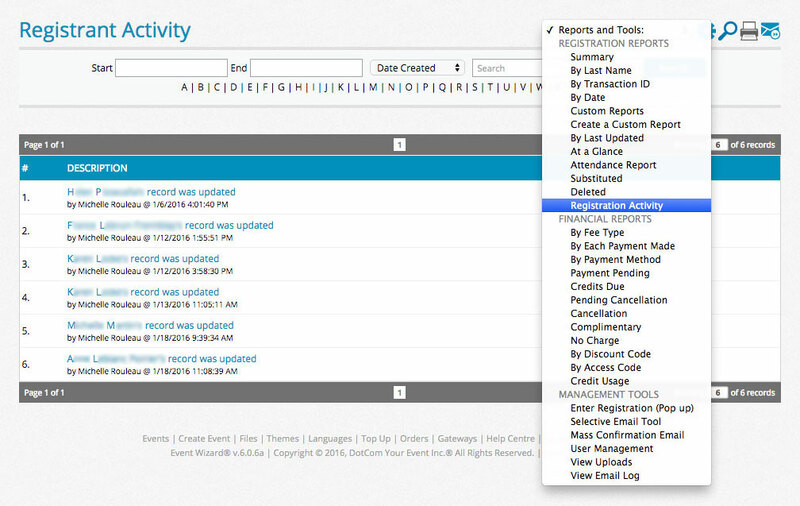 You can also view the activity for all registrants of an event. 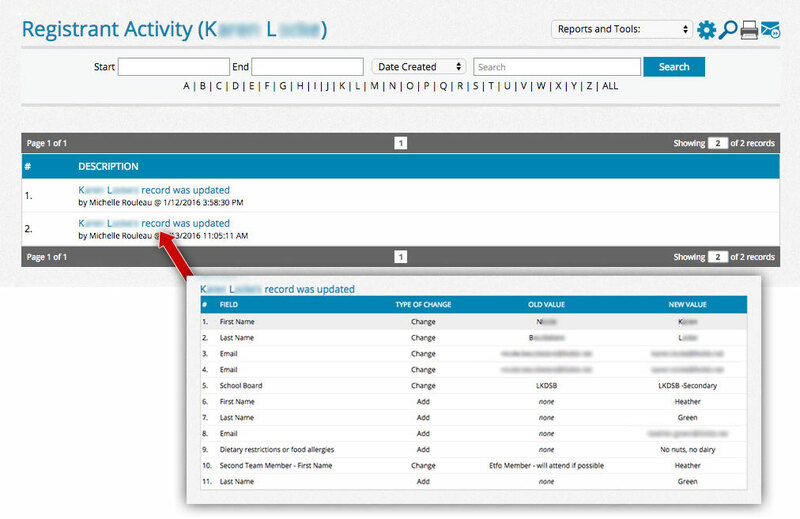 To do this, select Registrant Activity from the Reports and Tools dropdown in the reports section. Not only do we see the two records that we did previously, but we now also see the records that were updated for other registrants, in order of when they were modified. Furthermore, like the previous page, you can click the descriptions to view all the details for that particular record. We hope you find this new tool as useful as we do. If you have any questions about the new activity tracker or anything else Event Wizard®, give us a shout! Building your registration website pages is pretty simple, since the page builder incorporates a graphical online HTML editor. This means that if you can use a word processor, you can build your site pages with ease and you don’t actually need to know HTML or any other fancy coding. That said, one concern when using the editor is that you can’t really get a proper preview of your content on the site itself, and to this point, the only real way to do this was to make your page edits, save your content, and view your event. This has all changed with the new Page Preview function. When you go to edit any of your site pages, (ie: Welcome Page, Custom Pages, etc.) you’ll now notice two buttons appearing to the top-right of the online editor: these are your page preview buttons. The first one, Desktop, will show you a preview of how your page content will look on a standard desktop computer. The second one, Mobile, will show you how your content will look on smaller-screened mobile devices, such as an Android or iPhone. To try them out, simply make some content edits in the online editor and click one of the buttons. 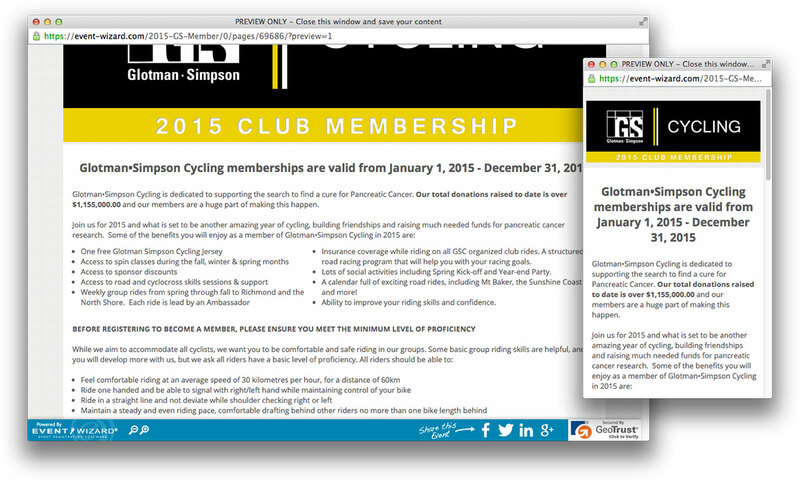 In the window that pops up, you’ll see your event in its entirety, including your header, footer, and navigation menu. The content that you entered in the online editor on the previous page will appear as the content for your preview, exactly how it will look when finished. This is great for making page edits to an event that is already live and taking registrations, since your edits won’t be made live until you click the Save button. That’s it. If you have any questions about this feature, or anything else in Event Wizard®, drop us a line. Ahh, the textbox – the Swiss Army Knife of form field types. It is found on just about every online form, and for good reason: it’s flexible. It can be used to collect a wide variety of information like names, numbers, addresses, or just about anything else. But, aside from reading the label, how can you determine what kind of information is being entered into a specific form field? Furthermore, how does Event Wizard® know? This is where the System Field type comes into place. Head over to the Edit/Move/Hide Form Fields page of one of your events and you’ll immediately notice there are a few fields that are highlighted – these are fields that have been set as a special type through the system. Click the edit icon for one of these fields and scroll down to the Properties section. 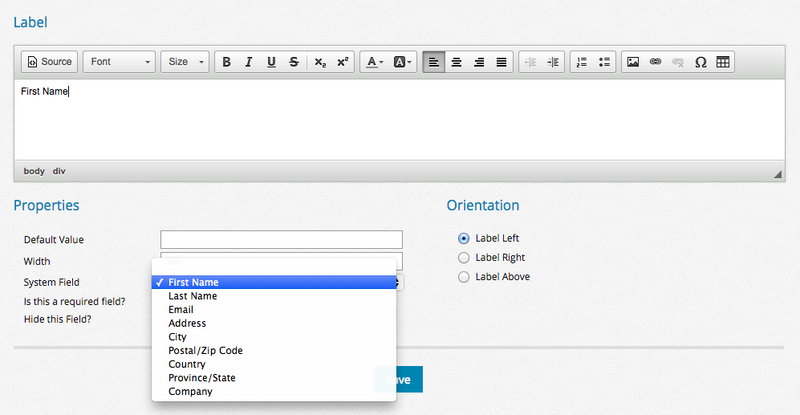 You’ll see a dropdown labeled “System Field” – this is where you can set the type, or identifier, for this field. By using these identifiers, you are telling Event Wizard® what kind of data each marked field contains, and to use it as such. For example, the First Name, Last Name, and Email field types are referenced in things like merge tags, emails, and pretty much all of your event reports. Now, by adding these new system field types, we have opened up the ability to use that data in other ways – for instance, if the form contains marked address fields, that data can be carried over to the payment page so the user doesn’t have to fill it in twice. Pretty neat, huh? We hope this sheds some light on a feature that you may not have known existed. As always, if you have any questions about system field types or anything else, you know where to find us. 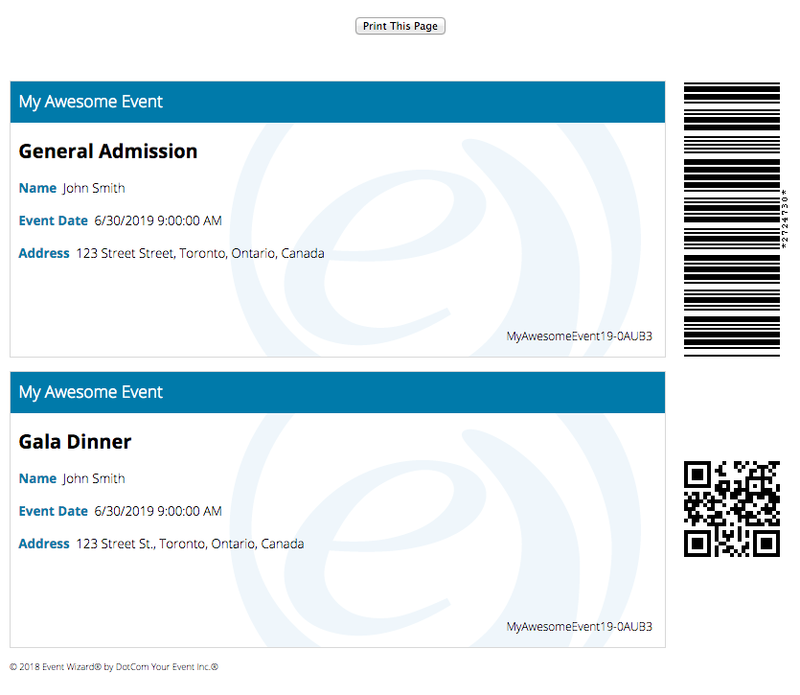 Part of Event Wizard®’s appeal is that it is extremely flexible and customizable. Because of this, we attract clients of all shapes and sizes, from the smaller individuals with a single event, to large event planning companies running events throughout the year. Sometimes our larger clients employ multiple people to build and run their events, so it can get a bit cumbersome if everyone has to share a single Event Wizard® account, (along with a single email and password). Enter the new sub-account feature! There are main accounts and sub-accounts, (also called “users” or “account users”). What is a main account? When you add a user to your account, you become the main account for that user, (and any other subsequent users you add to your account). 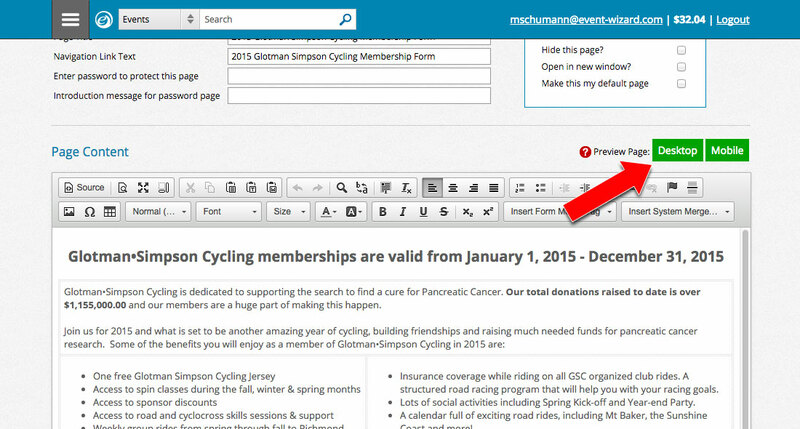 Main accounts can see and edit their own events as well as the events created by any of their user/sub-accounts. When you add a user, (or users) to your account, that user becomes a sub-account of your account. Sub-accounts can see and edit their own events plus the main account’s events. Sub-accounts cannot see each other’s events. Any event that needs to be accessible to everyone in your organization must be created by the main account. Start by logging into Event Wizard® and clicking the My Account icon in your main menu. On this page you’ll see a series of tabs that allow you to check or modify things like your Personal Information, Account Preferences, and Account Usage – click the Users tab and then the +Add New User link. If the email address entered is already being used by an account in Event Wizard®, the user will receive an email asking them to confirm your request to join to your account. If the email entered doesn’t already exist in Event Wizard®, a new account is created and an email is sent asking them to activate before it can be used. Once the above action is taken, the requested account will become a sub-user of the original account, and will show up under the Users tab on the My Account page. It’s important to note that the account balance ($) in the parent account does not get shared with its sub-users, (and vice-versa). For example, if a sub-user creates an event, they must have a positive balance in their own account in order to run it, since they are the owner of the event. The only exception is for annual license holders; if a main account holds an annual license, the user accounts do as well. That’s it! If you have any questions about this new feature or anything else in Event Wizard®, feel free to contact us. Use the Service Fee field type when creating your form to help recover the cost of using Event Wizard. When added, the service fee field will display on your registration form as a required fee that cannot be unchecked or removed. The fee will be processed as any other fee would on your form and just like that, you’ve recovered your per registration fee that we charge you when using Event Wizard®. You are also able to set the cost of the service fee to anything you like, so if you are really savvy, you could even factor in and recover your payment processing fees! To add the Service Fee field head into the Add a Field section of your task list and select Service Fee. Enter the field label as normal then set the price and click Save. 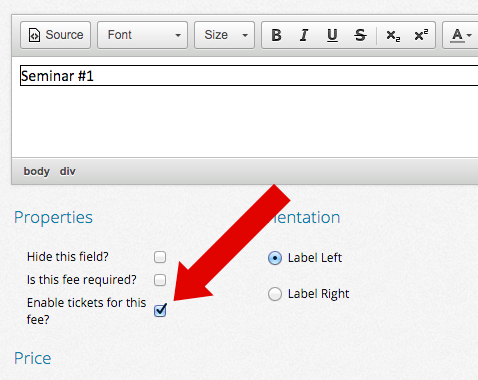 You can then move the fee anywhere you like on your form, but we recommend placing it close to the bottom. When your registrants process their registration form the fee will appear on the Summary page with the label you entered when creating the field. It’s important to note that you still need a positive balance in your account in order to run your event, but you will recover the costs after reconciling. The Service Fee can be processed using the Event Wizard Payment Gateway or your own personal payment gateway.